Halloween is a fun and magical time of year, but the spookiness surrounding the holiday doesn’t mean you have to sacrifice any elegance during your festivities. Some recent trends in adult Halloween décor have caught our eye — and they’re far from tacky. If you’re in charge of planning an elegant Halloween party or reception, we hope these fabulous Halloween decorating ideas give you some inspiration. Wondering how to create elegant Halloween centerpieces? To transform your table into a hauntingly gorgeous space, consider adding dramatic elements in varying sizes, heights, and weights that will add extra dimension to the décor, and make your tablescape pop. 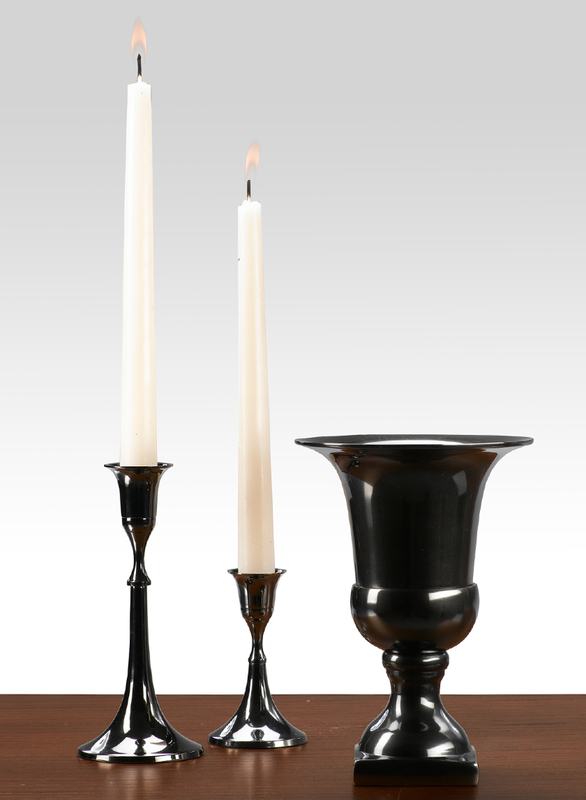 Create an eerie glow around the table with bunches of 4-inch and 7-inch black nickel candlesticks and add some tasteful monochrome elements like antiqued silver jars. Consider adding a floral arrangement with a mix dark, fall-colored flowers: dark red roses, black calla lilies, orange proteas, and burgundy cockscomb. While flowers may not be seen as a traditional Halloween décor staple, they’ll be sure to catch everyone’s eye and amp up the autumnal atmosphere. Pumpkins are a Halloween must-have; no fall activity would be complete without them. But if you’re throwing an elegant Halloween party, you’re likely looking for something with a little more flair and sophistication than a traditional hand-carved pumpkin can offer. Before you start carving out another pumpkin for your gathering, why not show off your decorating skills by taking your pumpkins to the next level? Statement pumpkins are a fantastic way to get into the spirit of the season while adding a dash of glamour to your décor. 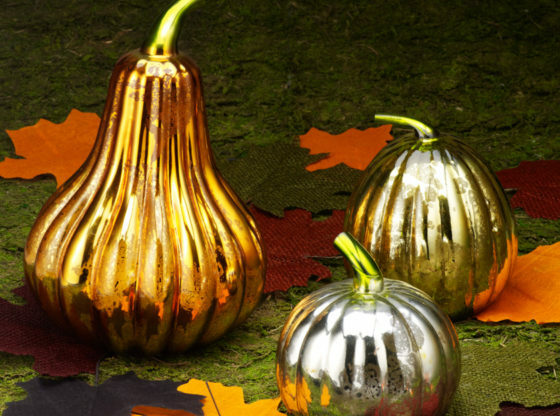 Instead of a traditional orange pumpkin, decorate with mercury glass pumpkins and scatter a mix of sizes throughout the event area. 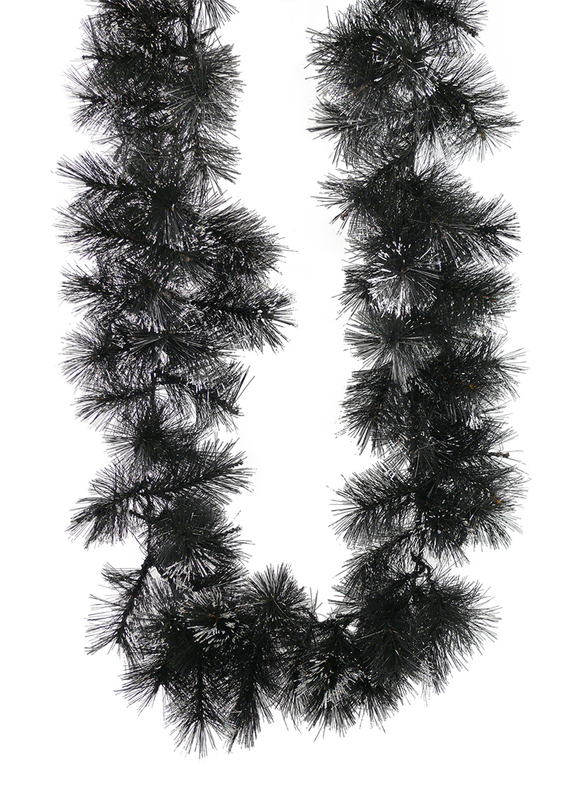 Surround them with some black bead garland for that extra wow-factor. Traditional orange and purple are fun and set the mood for any Halloween activity. But, instead of covering the venue in brightly colored decorations, set a more mysterious tone with classic black-and-white décor and metallic accents. From tablecloths, plates, and silverware to centerpieces and lighting, this refined palette adds intrigue to every aspect of your décor. Add small splashes of orange or purple to your color scheme to tie it all together. The little touches are what will really make your black and white color scheme pop. 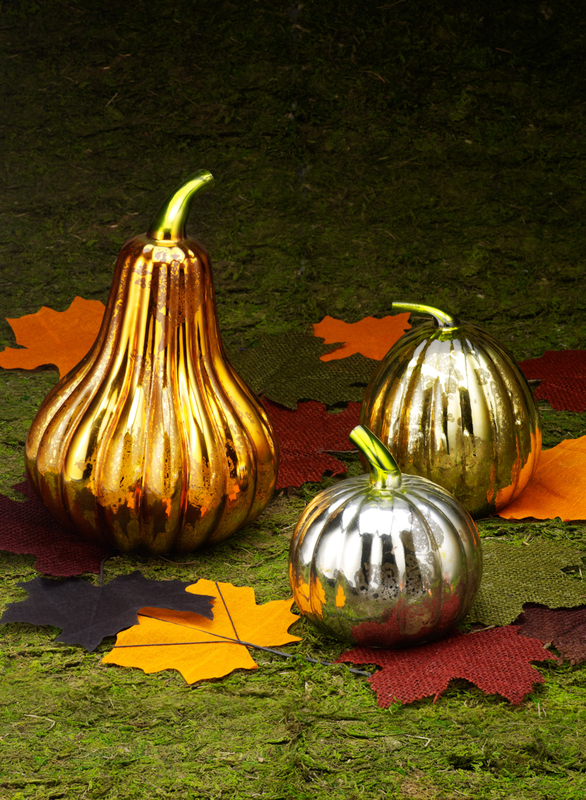 Any elegant Halloween party needs a few dazzling accents that will wow guests. By picking colors and textures that match your overall theme, you can combine fun and fabulous with grace and charm. Give banisters some Halloween flair with black pine garland and weave in some colored string lights to match your color scheme, a haunting amber or a glittery purple. Add other decorative pieces to a bar or mantel, like owls, or a witch’s boot. With an assortment of spooky, scary, and sophisticated Halloween décor suited for any serious decorator, Jamali Garden is the premier choice for your decorating needs. Browse our fall and Halloween selection now!